Note: This story has been updated throughout to reflect corrections made upon further consultation with Dr. Michael Collins. If you&apos;re from Houston, you&apos;re a Houstonian, in Austin, you&apos;re an Austinite. And in the central Texas city of Leander – you could be a Leanderthal? That unfortunate nickname for residents came about because of a misconception related to the findings of an archaeological dig a few decades baDr. Michael Collins is a research professor at Texas State University and the chairman of the Gault School of Archaeological Research. He’s in his 70s, and has done many archeological digs in his career. He says, you might not know it, but the dirt below your feet is full of insight into what life was like before our time on earth. Take a minute to think about the world the way Collins does. Say you’re standing in your backyard. Collins would tell you the layers of segmented soil beneath you are like a timeline. Each section contains clues about what life was like during those years. And sometimes, those clues can provide a whole a whole window into another world. And that certainly is the case at what’s called the Wilson-Leonard site, just outside of Austin. Before 1973, the land was part of the Wilson Land and Cattle Company. 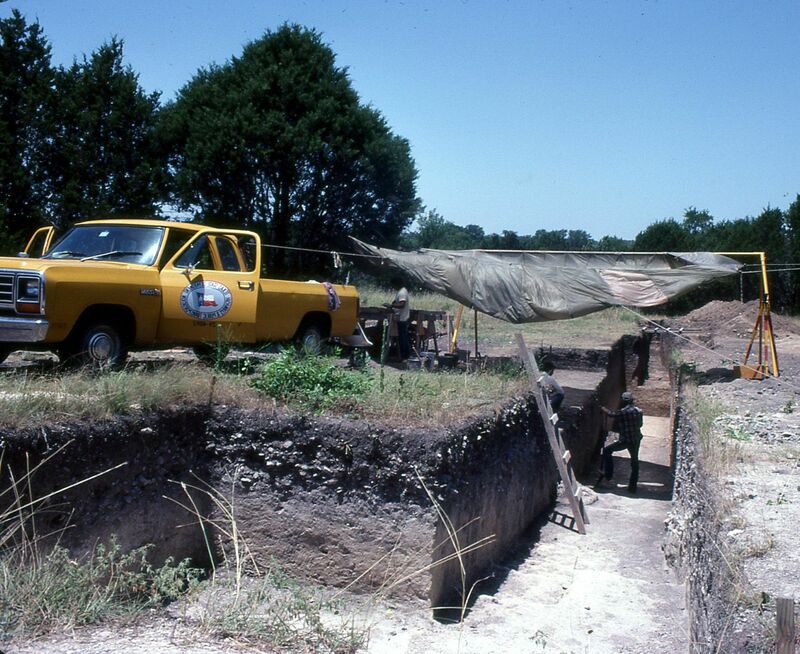 That year, Collins says archeologists with the Texas Department of Transportation – who were looking to expand a nearby road – uncovered something they weren’t expecting. It was a massive prehistoric campground, dating back 10,000 years. They found spear tips, grinding stones, and over 150 individual fire pits that were commonly used by Native American tribes during the period. 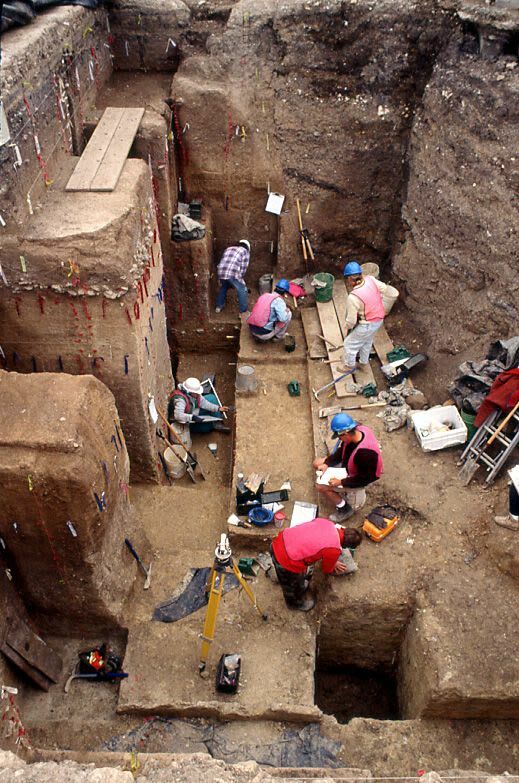 A decade later, in 1983, excavators uncovered the burial remains of a woman. “There were stone tools, there were fireplace-like features and so forth and so on, it was a pretty normal campsite, but then she was buried in a small pit within that,” Collins says. Collins says the team found the remains in a “flexed” or fetal position and placed in what would have been a shallow grave. The remains dated back to the Archaic period, some 8,000 to 10,000 years ago. Somewhere along the line, the skeletal remains earned the nickname “LeAnne.” The Williamson County Historical Commission website says it was members of the media who first began to call the remains the “Leanderthal Lady” because of the dig site’s proximity to the city of Leander. This nickname contributed to decades of misinformation about the age of the skeleton and what Collins says is akin to racism against early Native Americans. Inside the burial pit, archaeologists also uncovered a shark’s tooth the woman possibly wore as a necklace. Archaeologists also found cooking stones – indented rock used to boil water to cook one of the main food staples for Native Americans of the period, camas – the prairie flower that produced a starchy bulb similar to a small sweet potato. “So they would bake these things and then they pulverized the cooked camas bulbs into a cake, kind of like a hockey puck, highly nutritious. It is the ultimate trail food,” Collins says. He says the site is an important glimpse into life in North American at the time. Today, “LeAnne” is a permanent resident of the Texas Archeological Research Laboratory in Austin, or TARL. Associate Facilities Director Jonathan Jarvis says it’s the largest archeological repository in the state. “So say for example, the Wilson-Leonard site, when TxDOT sponsored excavations of that, that was excavated, studied, reported and all of that was brought here to TARL where we house that basically in perpetuity on behalf of the people of the State of Texas,” Jarvis says. Jarvis says storing artifacts from the site – and “LeAnne” – in a secure, climate-controlled environment gives generations to come the same opportunity to study the materials taken from the dig site. A 2007 article in the Hill Country News follows up on why the land itself where the remains were found is not open to the public or still being explored. The paper reports the original landowner, Will Wilson Sr., wanted to build an interactive museum, and maintain the 2.5-acre site as an archaeological laboratory. He partnered with the nonprofit Archaeological Conservancy on the project, and the paper reports Wilson viewed it as a way to memorialize his late wife. But the plans went south and the Hill Country News reports Wilson eventually granted the land to his son. The Archaeological Conservancy sued to reclaim the land. Ultimately, they lost in court. The Wilson-Leonard site has returned to pastureland. If not for markers including one from the Texas Historical Commission, there’d be no indication the archeological dig was ever there. Its discoveries are now housed miles away. Who knows what mysteries still lie under the soil. 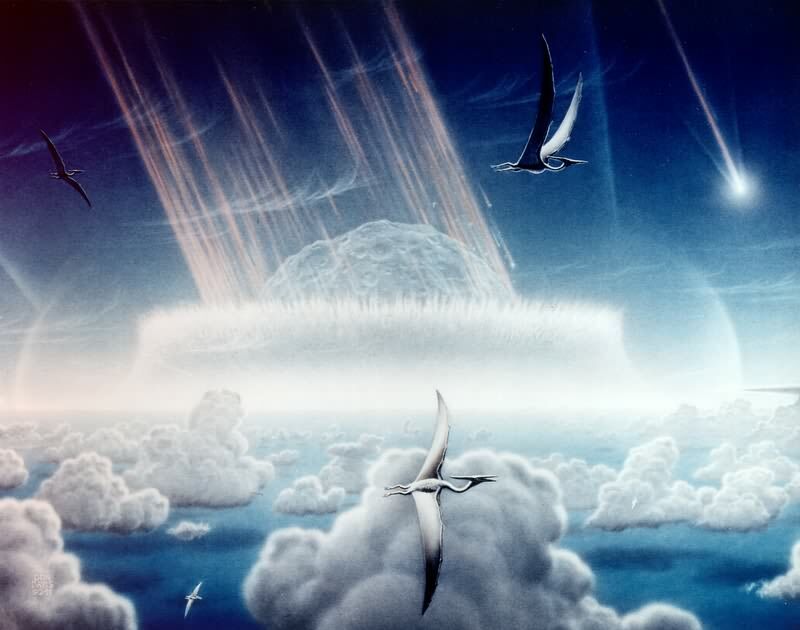 An artist’s impression of the Chicxulub asteroid impacting the Yucatan peninsula 66 million years ago as pterodactyls fly in the sky above. Credit: Donald E. Davis/NASA. 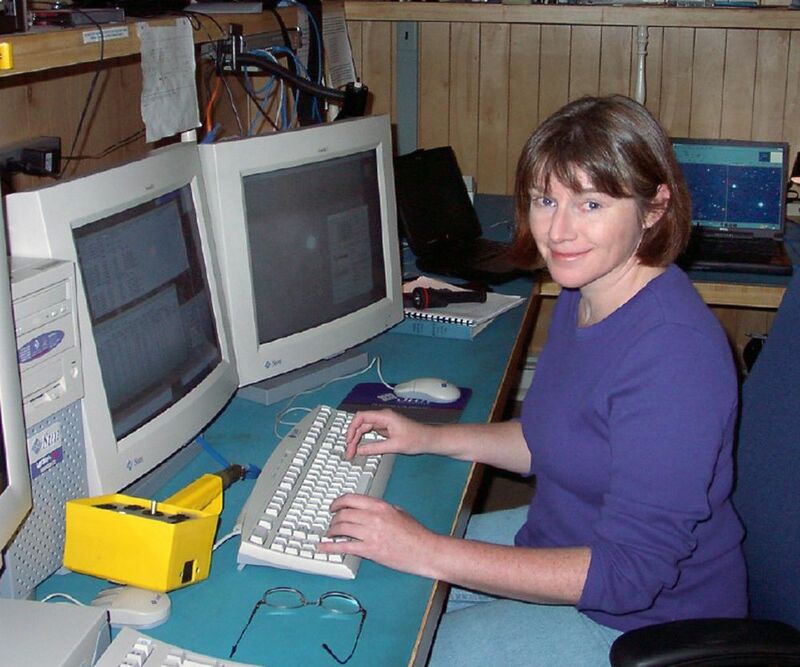 Judit Györgyey Ries studies asteroids for a living. That’s simply what one does as a research associate at the McDonald Observatory. Ries says that near-Earth asteroids can come close enough to the planet to hit it. She knows all abou the most famous near-Earth asteroid in history: it was 15 kilometers in size and wiped out the dinosaurs. While that is true, Ries notes that just 110 years ago, an asteroid devastated a marsh in Siberia. We’ll never know the number of casualties from this event. At least not the human ones. The destruction wrought by an asteroid doesn’t just come from the impact. Ries says that asteroids can create winds five to six times stronger than any hurricane and cause forest fires by launching molten rocks. “So, it can do damage,” Ries says. Ries looks for new asteroids that are 140 meters or longer. So far, she says there are 700,000 to 800,000 known asteroids. The Asteroid That Ended It All. Well, Most Of It. 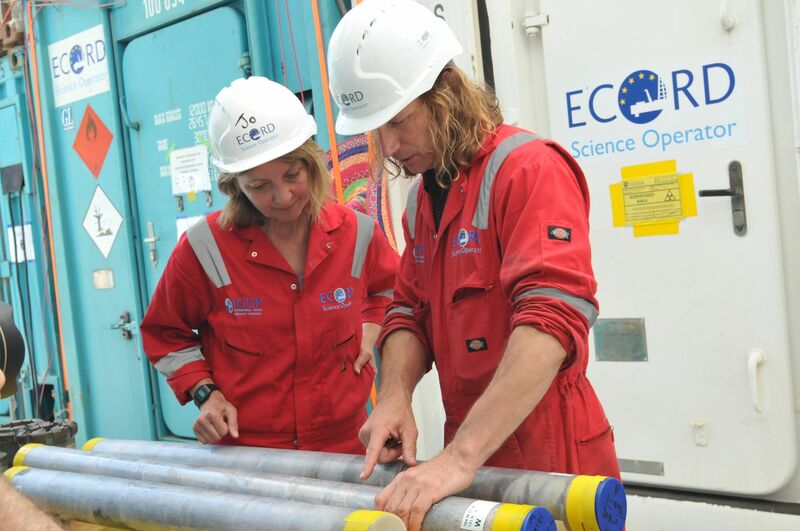 University of Texas Institute for GeophysicsResearch Scientist and Mission Co-chief Sean Gulick during the 2016 mission totake samples from the crater of the Chicxulub asteroid that killed allnon-avian dinosaurs 66 million years ago. Credit: Anna Donlan for Alcaldemagazine. It was 66 million years ago that the state of the Earth changed dramatically, all because of one asteroid – a really, really fast asteroid. Sean Gulick, a professor at the University of Texas at Austin, “explores the world” as he puts it. He’s a member of the Department of Geosciences. Recently he’s been studying the Chicxulub impact crater. Chicxulub is the asteroid that ultimately killed the dinosaurs and 75 percent of life on Earth. It’s impact created a wide, flat crater that was almost twice as large as the distance from Austin to Houston. This crater is perfectly preserved beneath the sea floor, and the land of the Yucatan Peninsula in Mexico, making it ideal to be studied. That’s because this asteroid was travelling at an incredible speed. Its impact was equal to 10 billion nuclear bombs. That collision set off a multitude of effects: earthquakes, a tsunami far higher than those created by plate shifting, a gaseous atmospheric change that lead to years of freezing and the eventual collapse of the food chain. Dinosaur names are sometimes a challenge to pronounce. But there’s one Texas dinosaur whose name will probably just roll right off your tongue. His name is Barney. Barney is a dinosaur from the imagination – and desperation – of Dallas-native Sheryl Leach. Back in the late 1980s, when her son Patrick was two years old, Leach struggled to keep him entertained. “Two-year-olds are the most powerful entity on the planet,” Leach said. But only for a little while. Two-year-old Patrick wanted more singing and more dancing and Leach just couldn’t find more videos that did the trick. She figured if she couldn’t find anything in Dallas, Texas, it was likely other parents around the country were struggling too. So, she decided to fill in the void herself with an original singing and dancing show for kids. Turns out it was really hard, but not impossible. And despite the challenges of recording videos featuring lots of kids and a giant purple dinosaur, PBS took the show when Leach offered it. Just four years later, Barney became the number one toy on kids’ Christmas lists. In a 1992 interview, the president of the Children’s Division at JC Penney, Henry Scott, said he couldn’t keep enough Barney merchandise on the shelves. “I’ve been in this business for 36 years, the retail business, and I’ve lived through E.T., I’ve lived through Cabbage Patch, I’ve lived through Land Before Time – but I have never seen a phenomenon such as Barney – we are Barney-mania here at JC Penney,” Scott said. The grownups couldn’t explain it. The kids couldn’t either, but their faces said it all. During a 1994, live performance in New York City, Barney took his time coming out onstage. And when he did, it was like Beatle-mania! 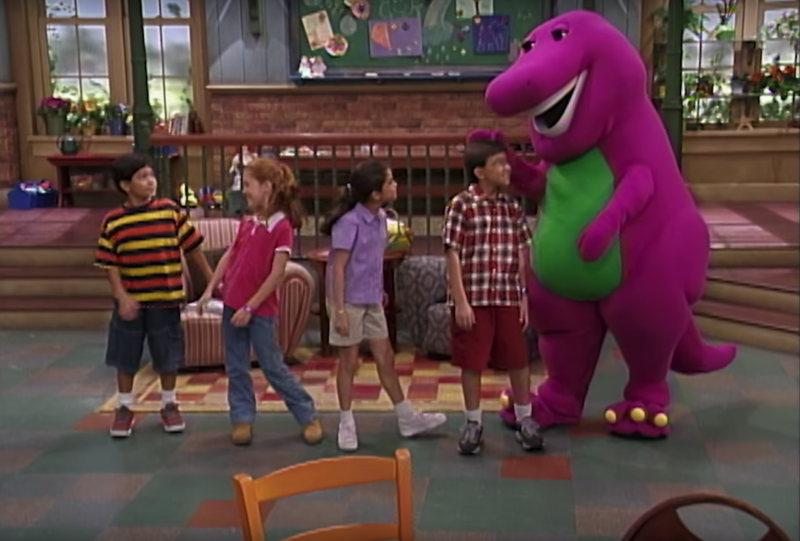 Back in Dallas, Barney creator Sheryl Leach believes Barney was such a hit because, as a former educator, she wanted to make the show good – good fun, good manners, educational and full of diversity. From the very first season, the cast included children with different abilities, with different skin colors and who spoke different languages. You may remember a young Selena Gomez or Demi Lovato singing in Spanish. Leach’s parents were also educators. They taught her early that growing up in Texas meant learning about Mexico and other cultures. “And we went back and forth almost yearly, I think, to Mexico. And so that was instilled in me as a very young thing,” Leach said. Barney also did shows about Canada, our neighbor to the North, but also about Italy, Germany, Scotland, Israel, Africa, China, South Korea and Brazil – many of the cultures represented right here in Texas. With all that exploration, it seems Barney yearned to try a place outside of the Lone Star State. In 2001, the show moved to the U.K. HIT Entertainment purchased the business for $275 million. The public didn’t understand this either – Barney was still a success, so why sell? “It was really the point that I felt satisfecha, you know? I really felt satisfied. And I also wanted to do other things. So, I felt that – if I thought about Barney as a child – at that point – that Barney was in college,” she said. Barney is probably the only Texas dinosaur that went to college! And to Sheryl Leach, that’s what Texas is – a family that can come together through singing, dancing and understanding of each other. On these warm summer nights, I see them often as I drive home on FM 803. They sometimes stop, frozen for a few seconds, their eyes reflecting my headlights in an eerie red – and then they dash off into giant clumps of prickly pear, where predators can’t follow. The Spaniards named them armadillos – “the little armored ones.” It was a term of affection and all who have lived in this land called Texas ever since have been fond of them. To me, they are the small animal version of an armored-up Humvee. And they are truly armored. A man in east Texas shot one with a .38 caliber pistol and the bullet ricocheted off the armadillo’s thick plating and hit the man in the face. He recovered. The armadillo could not be found. They are impressive survivors. In fact, in the land before Texas, four million years ago, their distant relatives roamed the earth. The original armadillos, called glyptodons, reached a weight of two tons, about the size of a white rhino. Plus, they had club-like spiky tails. If they were running around Texas today, we wouldn’t have roadkill, we’d have car kill. We’d call them armadigantes – armored giants. We’d need thick steel fences for them, probably electrified like those in the original Jurassic Park movie. Not sure you’d want to go home with the armadillo in such circumstances. Speaking of Jurassic Park, scientists, perhaps inspired by a scene from that film, compared the fossil remains of ancient glyptodons, to our modern armadillos. In 2016, two geneticists analyzed the ancient DNA of a glyptodon, comparing it with that of modern armadillos and found evidence that they are directly related. Why the original was so large or why its descendants became miniaturized is an unsolved mystery. In Texas, the nine-banded armadillo is the most common, and down in South America they have what we now call “giant armadillos.” But they’re only six feet long if you include the tail, and weigh 70 pounds. Still, if I saw one of those around here, I think I would go the other way. At the other end of the scale is the fairy armadillo, also from South America. It is only about four inches long and pink. You could hold it in the palm of your hand. Though our Texas armadillo can’t roll into a perfect ball, like the Brazilian three-banded one, it does have this special ability: the females give birth to four identical quadruplets every time, producing as many as 16 pups in a lifetime. Bet they’re glad they don’t have to send them all to college. The Texas armadillo – the nine-banded one – has certainly worked its way into iconic status here. There are armadillo t-shirts, tattoos galore, armadillo lamps (no armadillos hurt in the making of the lamps), armadillo campers and trailers and armadillo restaurants that don’t serve armadillo. However, during the Great Depression, an era many blamed on President Herbert Hoover, food was scarce, and many people in Texas hunted and ate armadillos, calling them “poor man’s pork” or “Hoover hogs.” Later on, people blamed leprosy in Texas on armadillo meat. No doubt, the best-known armadillo business, open from 1970-1980, was the Armadillo World Headquarters in Austin. The nightclub was named after the armadillo in order to commemorate the fact that it was located in the old National Guard Armory. Though long out of business, the Armadillo World Headquarters helped lay the foundation for the world-class live music scene that thrives in Austin today. WHEREAS: [The armadillo is] a proud and indomitable as the state from which it hails. RESOLVED: That the 74th Legislature of the State of Texas hereby . . . designate(s) the armadillo as the official Small State Mammal of Texas. The Texas Longhorn was made the Official Large State Mammal in the same legislation. And then we also have the unofficial honoring of the little armored ones in a famous song written by Gary P. Nunn. So the Armadillo is distinguished by legislation, protected by law, and immortalized in song. Is Texas a great country or what? Grady Hicks loves dinosaurs. 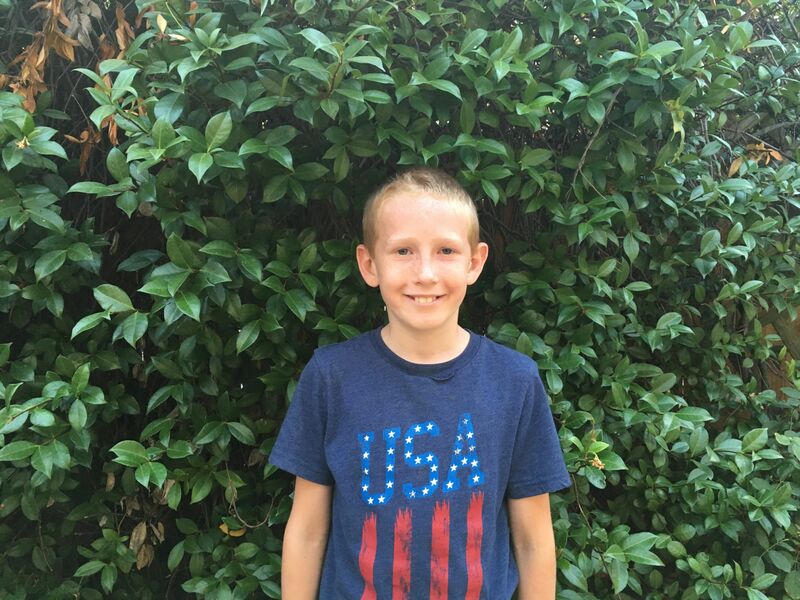 From stegosauruses to “Jurassic Park,” he Austin-native fifth-grader knows all that there is to know about our prehistoric friends. He knows so much that he was willing to share some of his favorite dinosaur jokes with Texas Standard. What do you get when you mix dinosaurs with pigs? What type of dinosaur would Harry Potter be? 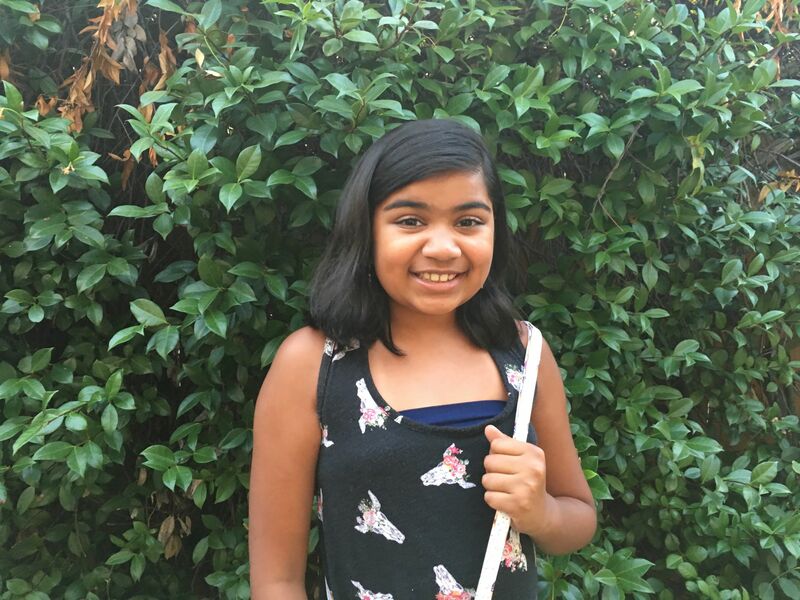 Shayna is in the fifth grade and is new to Texas. Her family recently move to Austin from California. What do dinosaurs use to make their hot dogs? What is a dinosaurs least favorite reindeer? Listen in the player above for the punchlines. With its latest iteration, “The Fallen Kingdom,” the Jurassic Park movie franchise seems far from extinct. But 25 years ago, moviegoers had never seen anything quite like those Jurassic dinosaurs onscreen. The movie captured the imagination of a generation of kids—some of them graduating into paleontology as adults. And what we know about dinosaurs has changed dramatically since 1993, says University of Edinburgh Paleontologist Steve Brusatte. He is the author of the recently-released bestseller "The Rise and Fall of the Dinosaurs: A New History of the Lost World." Brusette saw “Jurassic Park” in the theater as a child, and has now named more than 15 new species of dinosaurs. He says there’s a straight line between the movie and today’s dinosaur science. “And this is why, now, 25 years later, we&apos;re in the middle of this most exciting time in the entire history of dinosaur research, because there are more people than even before going out, looking for dinosaur bones all around the world,” he says. Scientists are now discovering approximately 50 new species of dinosaur per year, and have been for a decade. Another reason for the explosion of discoveries is that many countries are expanding their paleontological research. “So many of the most important new discoveries are coming from places like China and Argentina and Brazil, these enormous countries that are opening up to the world, that are developing, that are building their own universities, their own museums, and are training their own young scientists who are going out and looking for dinosaurs." At the same time, technology has been improving rapidly. “Developments in things like CAT scanning and 3D computer modeling and really high-powered microscopes, those kinds of new tools are helping us to study dinosaurs in ways that we would have thought impossible just a generation ago, and they&apos;re giving us new insight into what dinosaurs were actually like as real animals, what they looked like, how they moved, how they ate, how they grew up," Brusette says. But one thing technology hasn’t changed is how scientists find fossils. "It&apos;s still an old-fashioned game of just going out, and walking around and looking really intensely at the rocks, and looking for fossils that way,” Brusette says. Thanks to these new discoveries, we do know that there are quite a few historical inaccuracies in the Jurassic Park franchise. “The biggest one of all really is that the dinosaurs still, in the new film, are shown as these green, scaly overgrown lizard-type of animals,” Brusette says. “And in reality, we now know that a lot of dinosaurs had feathers. And dinosaurs were much more like birds in the way they behaved, but also the way they looked. And that wasn&apos;t actually known back in 1993 when the first film came out. It was only a few years later that the very first feather-covered dinosaur fossil was found in China. But now, 25 years later, we know that so many dinosaurs had feathers." But that doesn’t prevent Brusette from continuing to love the film, or from recognizing its power. Who Had A Head Five Feet Long, And Ate Everything? Deinosuchus Riograndensis. When you walk into the Fossil exhibit at Big Bend National Park, you’ll quickly spot a giant skull. It’s about five feet long, posed with jaws wide open. And it’s been completely bronzed. This late cretaceous-era cranium belongs to an ancient predator called deinosuchus riograndensis. the 1999 monster movie “Lake Placid,” you know what we’re talking about. Don Corrick is a geologist at Big Bend National Park. “That was deinosuchus! Yeah, yes. There’s some Hollywood to it of course. But yeah they’re using deinosuchus in that movie," he says. He says, yeah, the movie is over-the-top...but it actually undersold the size of deinosuchus. “It would be the top predator in the ancient swamps of big bend. It’d be 39, 40 feet long, 16,000 pounds,” Corrick says. The remains of bus-sized deinosuchus have been found in several states that were once underwater – places like Utah and Wyoming. And, of course, Texas’ Big Bend region, where we head out into the field. In his olive-green National Park uniform, Corrick stands in what he says used to be an estuary. It’s now a dusty, open field, littered with native shrubs and what look like milky-colored rocks, worn over time. These are fossils, Corrick says. “And as you walk along that’s what you find, the crumbs of ancient life...."
He spots something. “There’s a deinosuchus tooth. This is kind of a smaller one,” Corrick says. built for crushing. Paleontologists estimate that deinosuchus’ bite packed more force than that of a t-rex. "Friends" – says their diet was varied. “Apparently it ate anything. From turtles to dinosaurs,” Schwimmer says. Schwimmer has studied deinosuchus for three decades. He says the giant crocodylian was an indiscriminate predator – most likely approaching the shore slowly, nearly invisible to its would-be prey. And then, in the blink of an eye, it’d thrust out of the water and chomp down on nearby critters. Schwimmer says that besides teeth, the other thing that really sets deinosuchus apart are these things called osteoderms, or scutes – bony plates that covered the creature’s back. On deinosuchus, they were unusually large and lumpy. Schwimmer says they looked like giant, half-baked oatmeal cookies. “It’s a bone in the skin. It would’ve been biscuit shaped. Kind of oval shaped. And this is what kind of helps give it some sort of structural integrity,” Schwimmer says. 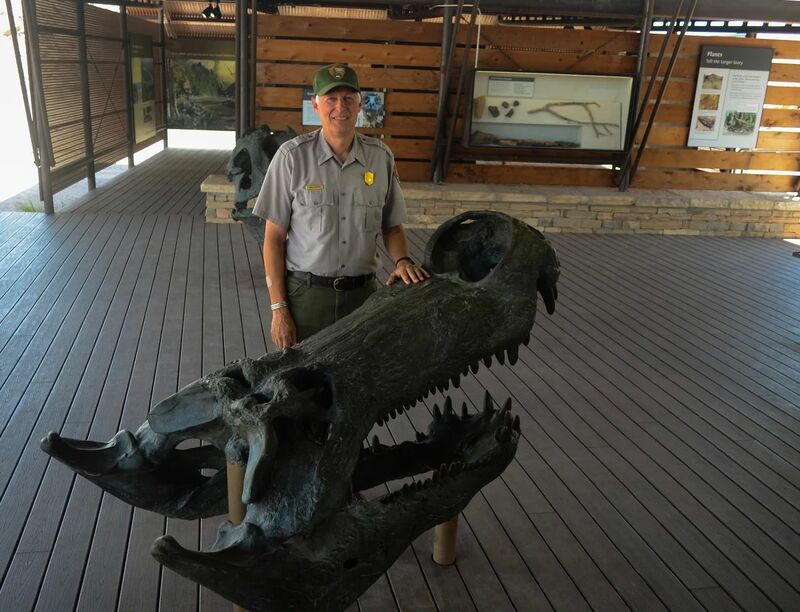 And there’s no better way to feel small, than standing next to deinosuchus riograndensis, one of the giants that roamed the land before Texas. When you think about prehistoric animals, the images that come to mind are probably large, reptile-like creatures – dinosaurs. 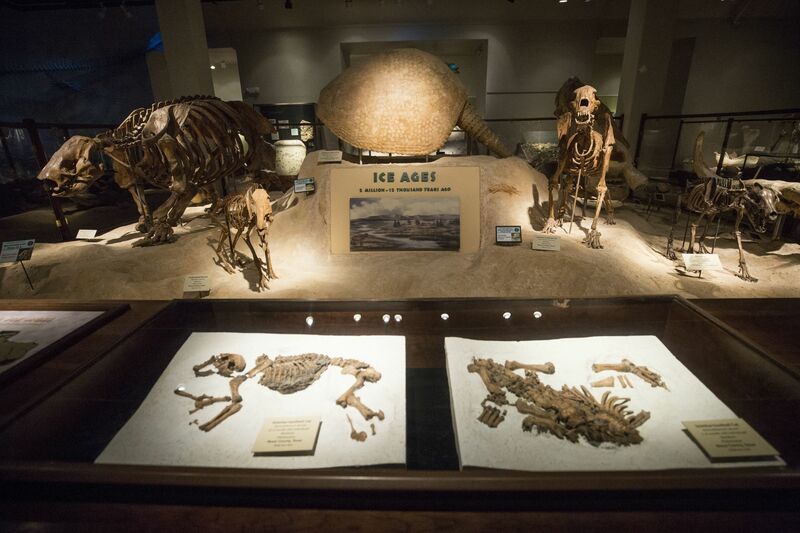 But before the land we know as Texas was Texas, the few remaining Ice Age dinosaurs shared the Hill Country with some critters that have a lot in common with modern mammals. Well, except for their longer, sharper teeth. I need to start with a confession. I’m a cat person. I have three. But I’m also a big fan of wild felines. And I’m not alone. My seven-year-old niece, Katie? She’s pretty keen on cats, too, even if the cats in question are thousands of years old. We’re standing in front of an exhibit at the Texas Memorial Museum in Austin. And we’re looking at three cats. I tell Katie they lived during the Ice Age. “Like you mean like, the old days when everything was gray?” she wants to know. Yeah, kind of gray. After all, the cats we’re looking at are fossils – two kittens and an adult who lived 10,000-20,000 years ago. And unlike the three I live with, they definitely weren’t house cats. Pamela Owen, associate director of the Texas Memorial Museum says the specimens on display are scimitar-toothed cats. Or – more scientifically, homotherium. “So we use the term saber-toothed cats to describe – at least here in Texas – two species that we know of that were living during the last Ice Age, the Pleistocene,” she says. Owen says the cat most people call a saber-toothed tiger had much longer teeth than these guys do. And they weren’t really tigers. Just call them smilodon. 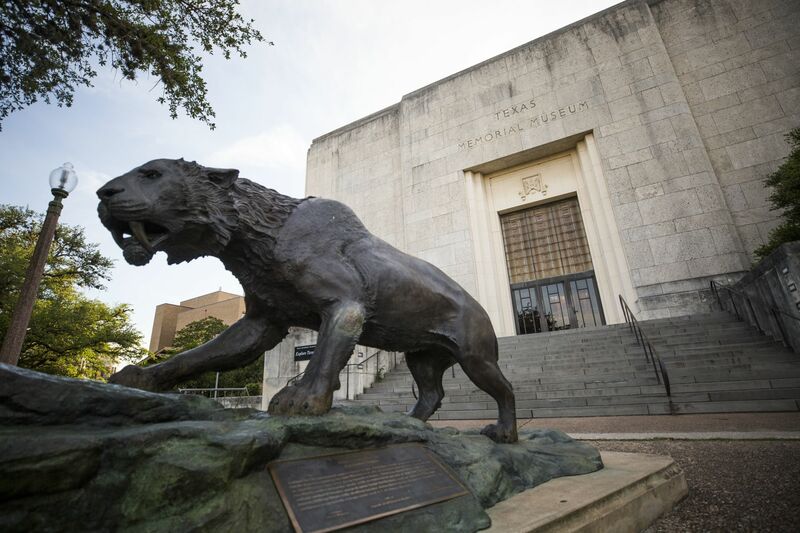 The statue of a saber-tooothed cat in front of Texas Memorial Museum resembles smilodon, not homotherium. Their teeth are serrated, like good steak knives. The adult homotherium at the Texas Memorial Museum is special because its skeleton is fully articulated. And the kittens are also largely intact. Having even one intact fossil gives scientists a window into what a prehistoric animal looked like, and how it lived. But Owen says the three cats here are all distinct. “The two kittens are two different ages, so they indicate two different litters,” she says. One was probably two months old; the other four months. Ernest Lundelius is a professor emeritus of vertebrate paleontology at the University of Texas. "I think this may be the best sample of homotherium that&apos;s known,” he says. At age 90, Lundelius still maintains an office at the UT Vertebrate Paleontology Lab. It’s just across from the university’s large collection of animal fossils. He says the cats’ teeth aren’t the only feature that distinguishes them from other Ice Age felines. And like the cheetah, he believes homotherium was built for speed. “This is a relatively long-legged cat, Lundelius says. “If you look and compare the lengths of the major limb bones to say a standard cat, particularly the other saber-toothed cat that we had around – smilodon – these are quite long-legged animals." 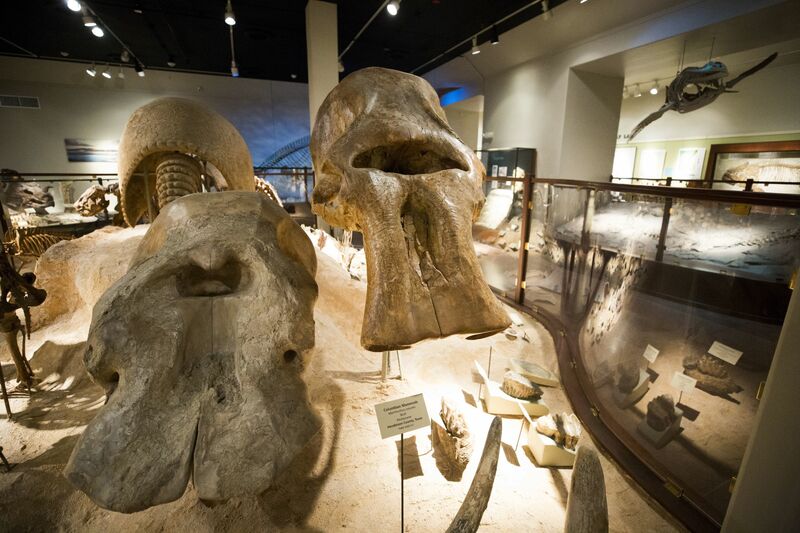 The homotherium at the Texas Memorial Museum aren’t just special because they are so fully intact. They’re also special because of where they were found. In the summers of 1949 and 1951, UT paleontologists located the three homotherium, along with a large number of other Pleistocene fossils, in a cave just north of San Antonio, on property owned by the Friesenhahn family. Owen says the museum also has other fossils from Friesenhahn. “We have a long-nosed peccary. We actually have a little black bear, and a funny little skeleton of a cotton-tail rabbit, which is often some of the visitors’ favorite skeletons,” she says. Some of the teeth and bone fragments in Friesenhahn Cave have a story to tell about homotherium. "These scimitar-toothed cats were found in a cave that contained the remains of over 100 juvenile mammoths – so baby mammoths,” Owen says. “And some of the bones had tooth marks, and evidence of an a carcass being dismembered." Now, even during the Ice Age, mammoths, or prehistoric elephants, weren’t cave dwellers. So they probably didn’t go in there voluntarily. In other words, they were cat food. "We can confidently say that homotherium serum did prefer these larger-bodied mammals like mammoths,” Owen says. Paleontologists can be confident about what saber-toothed cats ate because Friesenhahn Cave has been so well-protected from the outside world, for thousands of years. Laurence Meissner was a long-time professor of biology at Concordia University in Austin. He had a lot to do with making sure Friesenhahn Cave remains available for future exploration. Concordia acquired the cave 20 years ago. "The gentleman who owned it was getting ready to sell the land, and I mentioned to him, I said &apos;Wow, if this gets in the hands of developers, you&apos;ll never know what&apos;s going to happen.&apos; And so he donated to Concordia,” Meissner says. Since acquiring the cave, Concordia has removed excess dirt and debris, and reinforced the roof, to prevent damage. Meissner says Concordia is working with UT and others to create a management council to plan for future exploration of the cave, and to ensure it continues to be protected. During our museum trip, I told my niece Katie about the nearby cave where the cats – and other animals on display – lived. She had a theory about why a mother cat might raise her family in a cave, and how the sharp-toothed kittens might help keep watch. It might not have worked exactly like that back in the Ice Age, but Friesenhahn Cave did keep the homotherium family protected long enough to show paleontologists, and all of us, a thing or two about how they lived. Dinosaurs sometimes seem like creatures that only exist in movies. But long before we walked this land we call Texas, dinosaurs did it first. And at one point, about 260 million years ago, Texas was almost completely covered by water teeming with sharks and other sea life. The remaining evidence of these creatures – dinos, sharks, and other creatures – are what we call fossils. And you don’t have to be a paleontologist to find one. Just a little curiosity and a willingness to get a little dirty will do. 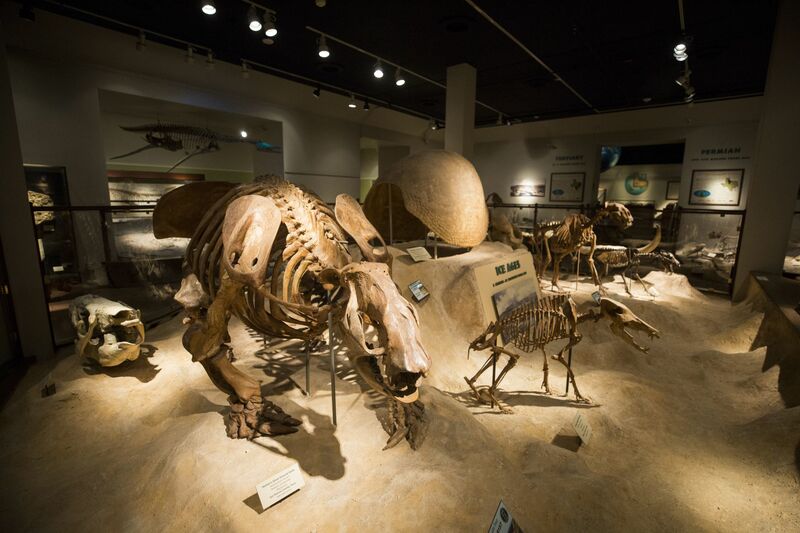 If you want to learn about fossils, you might head to a bastion of old bones on the University of Texas at Austin campus – Texas Memorial Museum. Among the displays of animals who once trod or even swam over Texas eons ago, you can find Pamela Owen. She’s the associate director of the museum. As a vertebrate paleontologist, she knows a lot about fossils – and badgers. Fossils can answer these questions. As it turns out, a fossil isn’t just something that’s old. It doesn’t even have to be a bone. According to Owen, a fossil can be any evidence of past life, like a part of the body (a bone, tooth, or a shell, etc. ), or some evidence of an organism’s behavior, like a footprint. Owen uses a mammoth’s foot bone to help teach museum visitors about fossils and the fossilization process. The bone is brownish and surprisingly lightweight. You wouldn’t think twice if Owen told you it came from a 20th century elephant. That’s because this mammoth bone hasn’t become completely petrified. But a bone doesn’t need to be to become a fossil. Basically, it just needs time. “We’re typically talking thousands of years to millions of years ago, not a 50-year-old cow bone,” Owen says. Owen says a bone needs to be at least 10,000 years old to be truly considered a fossil. That’s around the time of the last Ice Age. This fact always leads to a little bit of disappointment on Fossil Identification Day. It’s the museum’s annual event where amateur paleontologists and enthusiasts bring what they’ve found, to be evaluated. Many sleuths are told they’re simply bearers of old bones or teeth. But this isn’t to say you couldn’t stumble upon something huge or important. 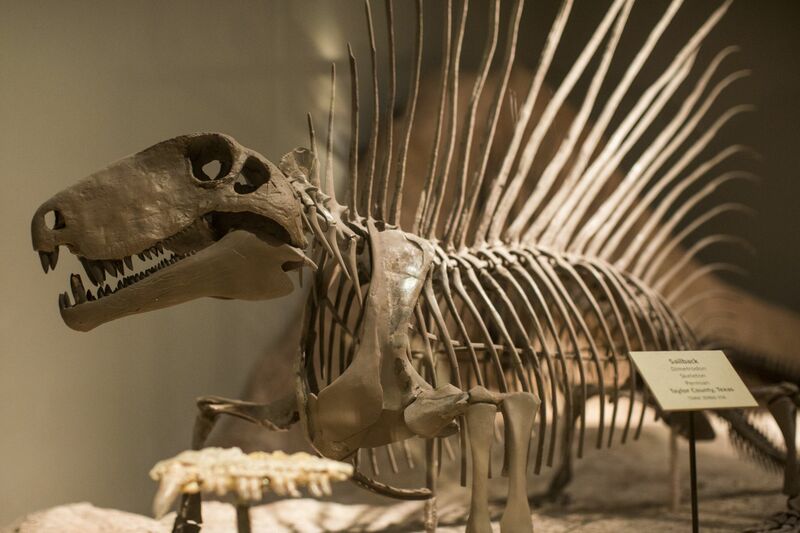 In fact, one of the largest fossils at the Texas Memorial Museum was found by an Austin dentist in 1991. It’s the Shoal Creek Plesiosaur, and it lies in state on the bottom floor of the museum. It has big flippers and looks kind of like a dolphin crossed with an alligator. Finds like the Shoal Creek Plesiosaur reflect how great Texas can be for fossil hunting. They’re everywhere, and anyone can find one if they look hard enough in the right places. That notion is perhaps best exemplified by Wes Kirpach. He teaches biology at West Plano high school, and for the past fourteen years, he’s taken hundreds of students out fossil hunting at a nearby creek. It’s an area rich in fish bones, seashells, and shark’s teeth. But on top of that, Kirpach’s students have made their share of large finds as well. 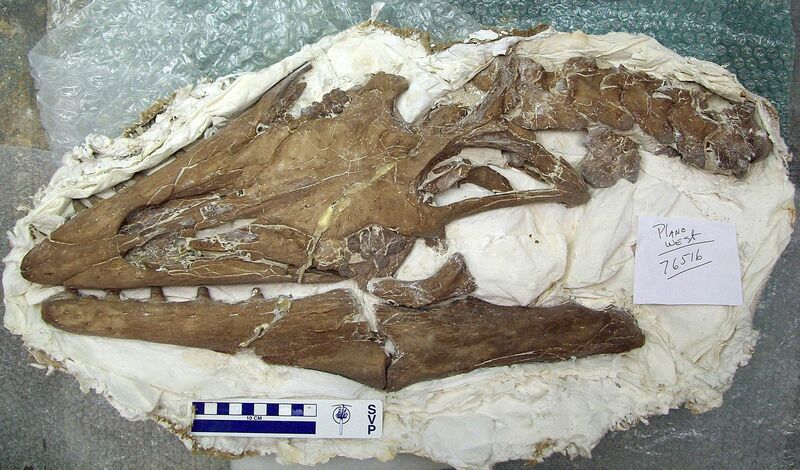 They’ve unearthed a mosasaur that’s currently being studied at Southern Methodist University. And they very well may have discovered a new species of ammonite. While not everything in the creek is worthy of its own scientific paper, Kirpach says every student he’s taken to the creek has come out with a fossil. Kirpach says his students enjoy fossil hunting in the campus creek. But maybe not all of them as much as Jordan Lee. He graduated from West Plano this year. He’ll be going on to UT’s pre-med program, but he plans to continue fossil hunting in his spare time. Lee’s passion for fossils started around age five, when his father gave him a four-and-a half inch megalodon tooth. He was mostly just a fossil collector – until he met Mr. Kirpach. And so can you. If you’ve been bitten by the fossil bug, you could end up like Lee did, filling a third of your family’s three-car garage with some of your larger finds. To get started, look for one of the many paleontological societies in Texas. Most of them have Facebook pages. 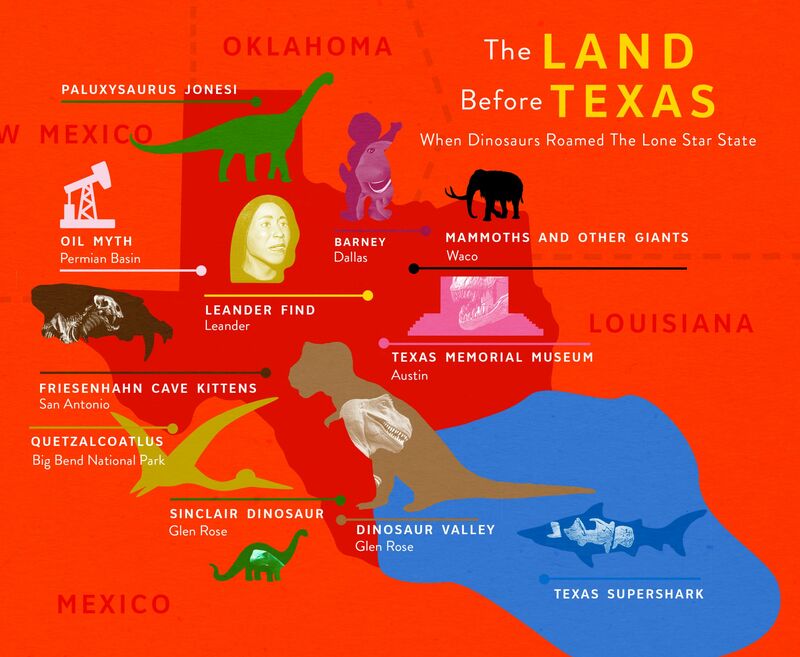 Once upon a time, about 260 million years ago, the land before Texas was not really land at all. In fact, Texas was completely covered by ocean. 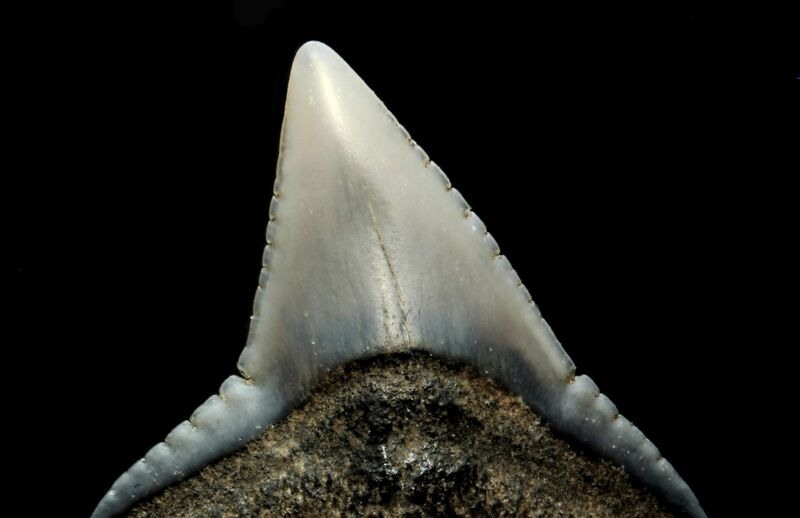 Roger Ferris, author of “The Collectors Guide to Sharks and Rays from the Cretaceous of Texas,” says that&apos;s why it’s so common to find shark teeth and other remnants of ancient aquatic life in our often hot, dry state. Ferris says that while dinosaurs were stomping around the land, marine life including sharks swam over the Lone Star State. For the last several weeks, we’ve been featuring stories for our series “The Land Before Texas: When Dinos Roamed the Lone Star State.” But the truth is, that title is a little misleading. Because not all of our stories about prehistoric Texas have featured dinosaurs. There were the ancestors of sharks when Texas was covered by ocean, and then the big-toothed cats. But what’s in a name anyway? There may just be something about the word itself that makes us want to use it – a lot. Pamela Owen is the associate director of Texas Memorial Museum. “‘Cause it’s a fabulous word. Dinosaur,” she says. Owen knows a lot about dinosaurs – and what people think of them. “You know it’s this terrible lizard, terrible reptile. You know, it’s got strength but at the same time it sounds ancient,” she says. Where she works, there’s one specific creature that often gets called dinosaur. 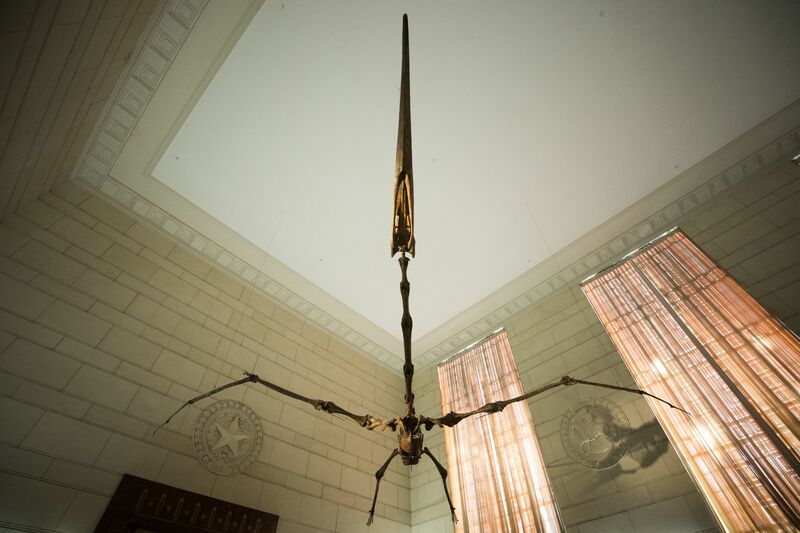 “You’ll come up the stairs and above your head is this quetzalcoatlus,” Owen says. Thankfully, Owen has been asked this before. And she has an answer even a non-paleontologist can understand. There’s more – but that’s the simple answer. 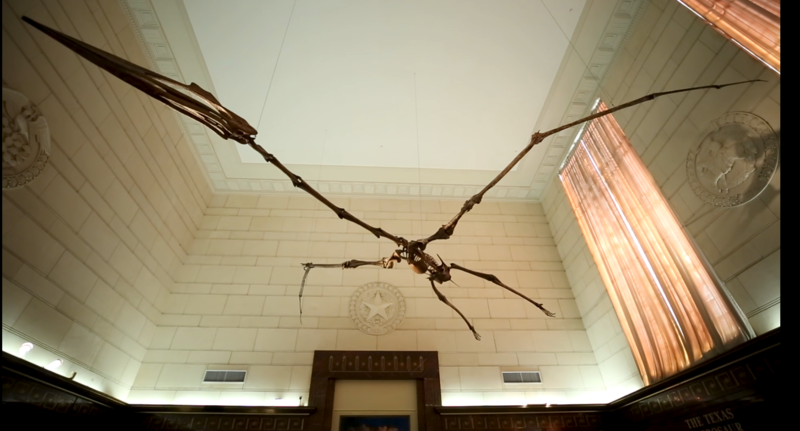 Now, let’s get back to that quetzalcoatlus – a pterosaur – actually the biggest pterosaur ever found – and found right here in Texas. Nowadays, Doug Lawson is a research scientist for Southwest Airlines. But back in 1971, he was just a student in the right place at the right time. “When I was a graduate student at University of Texas at Austin I was working on my master’s degree and that’s when I discovered the largest flying creature when I was working in the Cretaceous sedimentary rocks in the Big Bend area of Texas,” Lawson says. In Lawson’s case, the bone he found exposed was part of the upper arm of the pterosaur. More of the wing was beneath the surface – but much of it had apparently eroded – and the rest of the creature was nowhere to be found. But what he found was enough. “The wrist of pterosaurs is pretty unique – so once I realized what that was I knew we had a huge flying animal because, you know, this is practically the size of a soccer ball and it’s its wrist!” he says. The size came as a bit of a shock to scientists. Most already-discovered pterosaurs were more like the size of a modern bat. And scientists also knew of one with a 15-foot wingspan – much bigger than any flying animal today. quetzalcoatlus had a 40-foot wingspan. “So this was quite a leap from 15 feet to about 40 feet – so uh, more than doubling the wingspan of anything that had ever flown,” Lawson says. Again… 40-feet… that’s about as long as telephone poll. Can you imagine what that’d look like on takeoff? Lawson thinks quetzalcoatlus wouldn’t have taken a running star – but more likely would have started from a high place. “Because all they have to do is get high enough to bring that wing down once, right? To get that lift,” he says. But Lawson says once airborne… it doesn’t seem quetzalcoatlus would soar over great distances. No fossils have been found over marine sediment – just on what was land. And arid or semi-arid land at that – like Big Bend. “So we have to try to figure out what was such an animal doing in a semi-arid, mountainous valley that didn’t soar and glide around a whole lot and was basically toothless based on the skull of the littler specimens,” Lawson says. The answer is not all that clear. But Lawson has an idea. And since he’s quetzalcoatlus’s founder – his estimation is worth something. Sort of like an ancient vulture. So maybe you can think of quetzalcoatlus next time you see one. And it’s true that birds today are actually the closest living relatives we have to dinosaurs. That’s a lesson Pamela Owen often teaches curious kids at the Texas Memorial Museum. She keeps a mounted skeleton of one modern bird in the museum’s paleo lab. But – though birds are descendants of dinosaurs – they aren’t exactly on the same branch of the family tree. But of course they’re not all the same thing. And if you’ll remember – that’s how this whole story began. “You know the downside of calling things say a flying dinosaur or a swimming dinosaur or this is a dinosaur fish anything like that is that you kind of take away, you know, the magic of the diversity of life,” Owen says. But not everything that’s old is a dinosaur. It may be something else that’s very cool in its own way.